Warning: This is a long one. If you’re more interested in just the nitty gritty race details, check out my review on BibRave.com. Don’t forget to review all your races on BibRave to help your fellow runners! I was staying at a host resort, so transportation was super easy. Kim and I hopped on a bus right about 7 pm, and we were at WWoS shortly after that. I checked my gEAR bag and we were joined by Kellie and Nicole. While we were waiting for the start, I finally got to meet fellow BibRave Pros Heather and Danielle, which was so much fun! I hope we get a chance to hang out more in the future. Now here is where things went a little sideways. A little after 9 pm, a high wind kicked up, and it started to spit rain. Shortly after that, the announcer came over the speakers and said that due to “extreme weather conditions in the area” all 14,000 runners and spectators were being evacuated into either Champion Stadium or the HP Field House. Huh? Watching the sea of runners move from the staging area up into the WWoS complex was so surreal. The worst part about the situation is that there simply weren’t enough bathrooms to accommodate everyone. Every line for a ladies room we passed as ridiculously long, so we kept walking toward the end of a concourse, to find that two lovely ladies had commandeered a men’s room. Seriously, these ladies guarded the door and kindly but firmly informed every male who came over that this was now a ladies room. Thank you, mystery ladies! We waited. And waited. And waited. They were playing music in the stadium and trying to keep everyone happy, but it was tough to stay excited, not knowing if or when we’d get to run. My one gripe at this point is that they kept making announcements, but didn’t turn the music off while doing so, so it was difficult to hear and understand what was going on. Eventually, we were given the news that the course would be “slightly altered,” and that we should head back to the staging area. Of course, they weren’t telling us what the alterations would be, and how long the race would actually be. By the time everyone got back to the staging area and then over to the corrals, it was already 11 pm. 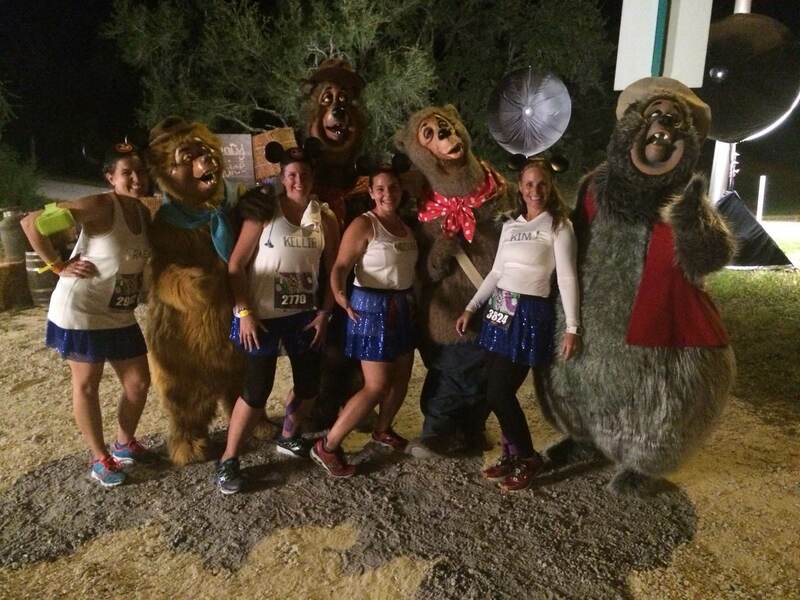 Finally, someone in our group was able to get online and determine that the entire Animal Kingdom portion of the race was eliminated, and the course would now be just short of 7 miles. To say I was disappointed was an understatement. 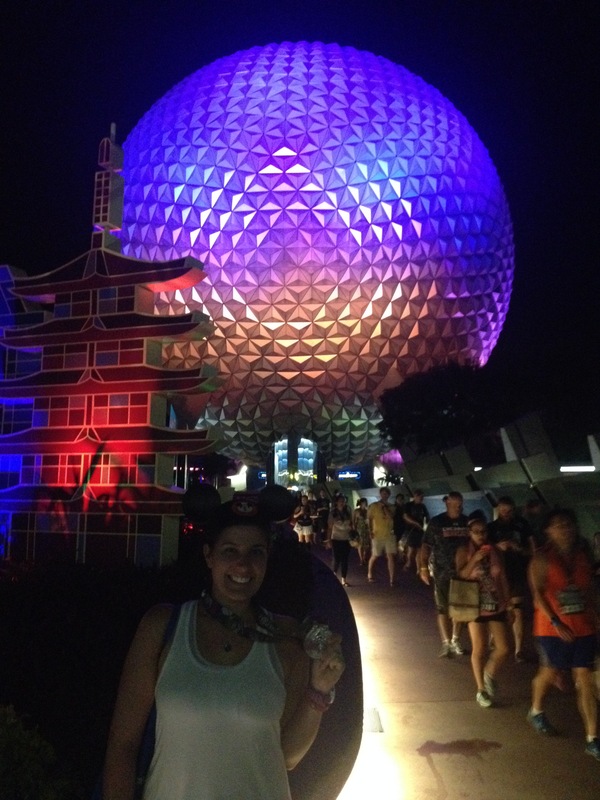 My first runDisney race, and my only half marathon this year, would be shortened by almost half. AND I hadn’t visited Animal Kingdom because I thought I’d get to see it as part of the race, so it was like a triple whammy of bad news. As we waited in our corral to start, I did my best to stay psyched up. I would still get to run with Team Can-Am. I would still get to run through the Osbourne Lights. And I’d still get to go to the after-party. 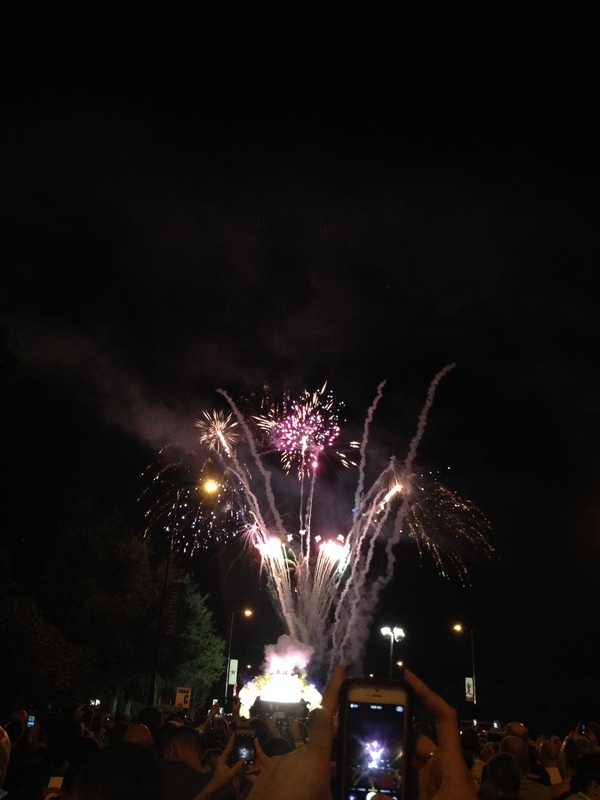 And I’ve gotta say, when our corral’s fireworks went off and we started running, I perked up right away. Because Kellie’s hip and ankle were really bothering her, we decided to do 4:1 run/walk intervals, and walk all the water stops. It was really hot and humid, so I was happy to be doing intervals. I’m not super familiar with the race course, so I basically just broke it up in my mind by character stops. Our first character stop was the bears from the Country Bear Jamboree. Next up were the green army men from Toy Story. For those of you who don’t know, Danielle started an unofficial challenge that we now refer to as the Nardi Challenge. When you see the army men, it’s time to stop, drop, and push-up! 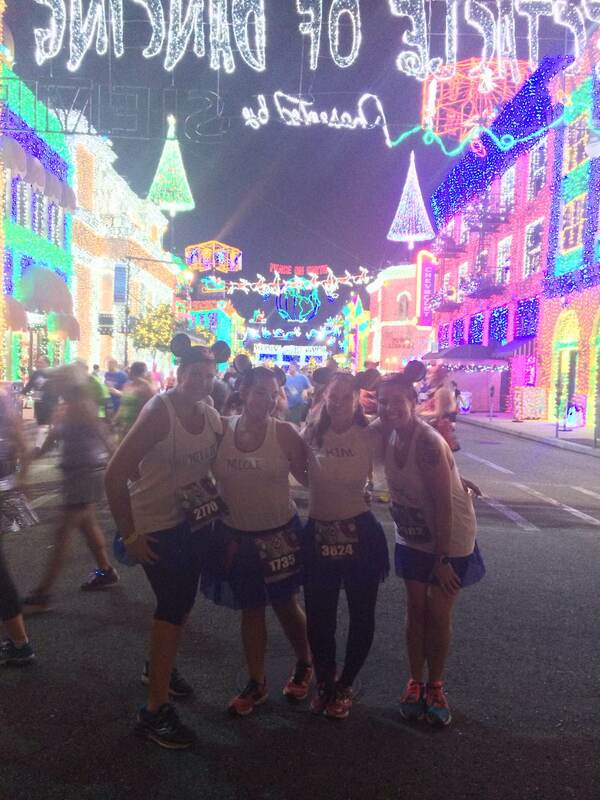 My favorite part of this course, though, was running through the Osbourne Lights in Hollywood studios. I’d heard about how awesome it was, but I was not fully prepared for how overwhelmed I would be by the magicalness of it. From here, we ran on a really narrow path along the boardwalk from Hollywood studios into Epcot. It was super crowded and hard for our group to stay together, especially trying to do run/walk intervals, but we made it work. As we came into Epcot, Kim’s husband Ed was waiting to cheer for us, and had a Bailey’s cocktail for Kim, which she carried for the remainder of the race. It was at this point that I had my only truly negative experience: some lady apparently didn’t like the fact that I was walking, even though I had carefully signaled that I was going to stop running, and moved to the side of the course. This women physically put her hand on my waist and pushed me out of her way. I just shouted, “EXCUSE YOU!” Because what else could I do? But seriously, I would NEVER do that to someone during a race, especially not a race that was already not really a race anymore, and in Disney? Come on, lady! Get over yourself. And then we finished. Yay! Getting into the post-race party was a bit of a cluster. The finisher’s chute is long and crowded. You get a medal, a Powerade, and a food box. There are photo ops, but the lines are stupid long, so we just went to bag check. Shout out to the bag check folks, here: I walked into the tent, and before I could even look down at my bib number to see where to go, they already had my bag ready for me. Thanks! From there, figuring out where to go was a bit tough. It was super crowded, and the congestion was massive. They split you into men or women to go to the changing tents, which are stupid busy. And then the line that they forced us into was actually going the wrong way, so it took a really long time to get where we were going, and then the post-race beer was Mich Ultra, which is just… gross. I know it’s a free beer and it could have been worse (I guess? Is there a worse beer than Mich Ultra? ), but still. And then we FINALLY made it through that line, and we STILL had to wait to get into the post-race party. PRO TIP: if you can take everything out of your gEAR check bag and either wear it or carry it, you don’t have to wait through bag inspection. Second PRO TIP: don’t wait for the line in the changing tents. 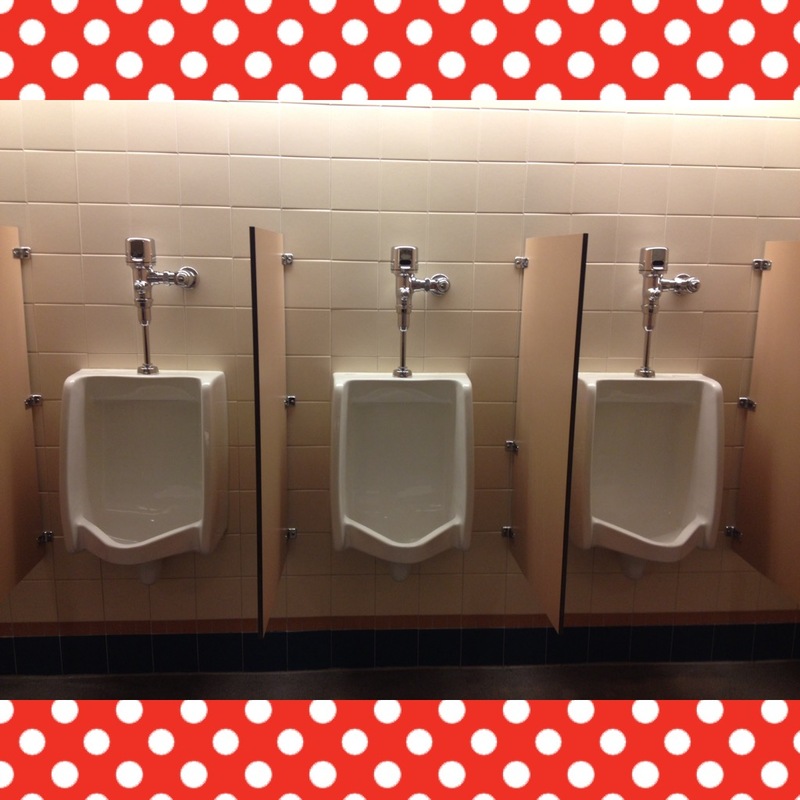 Find a bathroom in Epcot and change there. We made a beeline straight for Soarin, and changed in the bathrooms there, then went Soarin’ over California before heading off for Food and Wine. Epcot was busy, but not awfully so. We never had to wait more than a few minutes for the food we wanted, and we actually closed out the party, staying in the park until they shut it down at 4 am, which is WAAAAAY past my bedtime. I never expected to stay out that late, but I’m glad I did. Have you ever had a race course shortened like this? Or canceled entirely? How did you feel? It’s like reliving the magic all over again! It was when everyone was talking to Grouper. It took everything I had not to run after her and push her back. 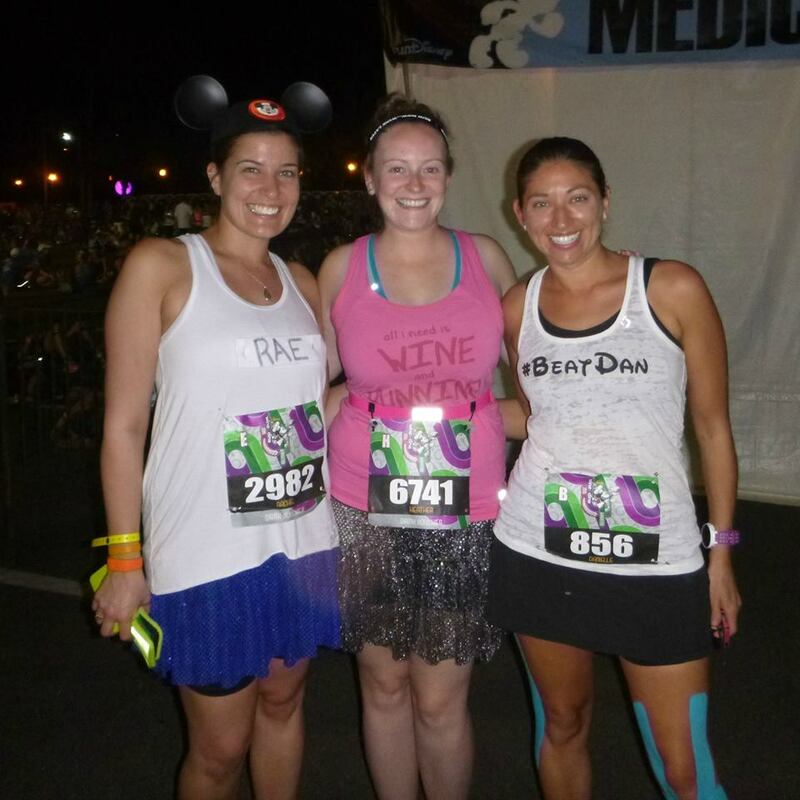 I loved Disney Marathon and would love to try this race! I haven’t been at a race that was cancelled or shortened, but am sure that it would be disappointing! Are you training for another race? I’m sorry that parts of this race ended up being such bummers… I know you were looking forward to it! 😦 And seriously, what’s up with that lady pushing you?? I would have been so ticked off. Those pictures are great, and the Osbourne Lights are amazing! I’m glad you managed to have a good time regardless! So sorry they had to shorten the course, but overall it looks like you still had an absolute blast. The picture with all of the lights is incredible!!! Makes me want to check out that race. I never had a race shortened or canceled, but I did run Boston in 2012 when it was hot, hot HOT and humid – 90 degrees with 95% humidity – and it was crazy rough. I would have preferred a shortened course that day! Those Disney race directors know what’s up! Yeah, it was still hot and humid even though it was nighttime, so it was kind of a blessing in disguise that it was a shortened course. Great attitude. I would have been disappointed since it’s expensive. But you had fun. Worth it, right? great perspective. I can imagine it would be a bit disappointing but I’m glad you were able to find some positives! 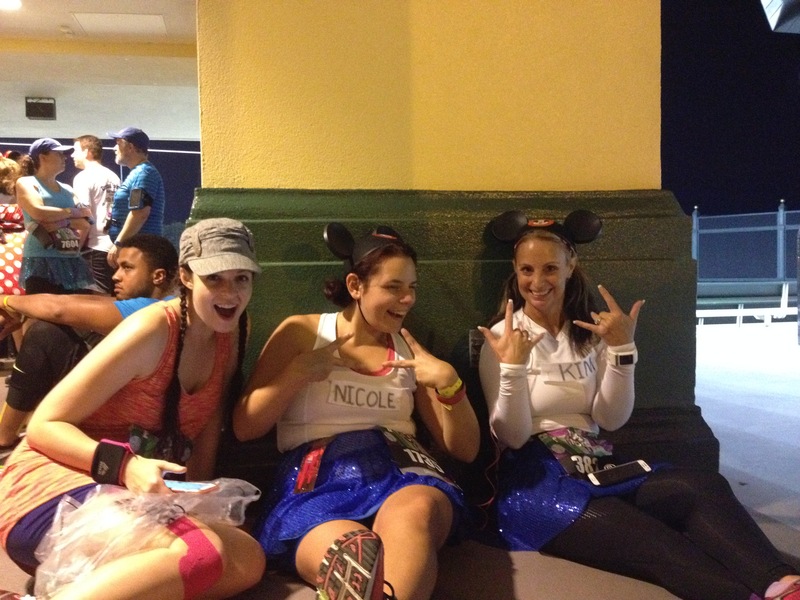 I was SUUUPER bummed at first, but it’s hard to stay upset when you’re running in Disney with your friends. I’m sorry to hear that it was such stressful start and a shortened course. That said, it looks like you had an amazing time and that’s what counts! 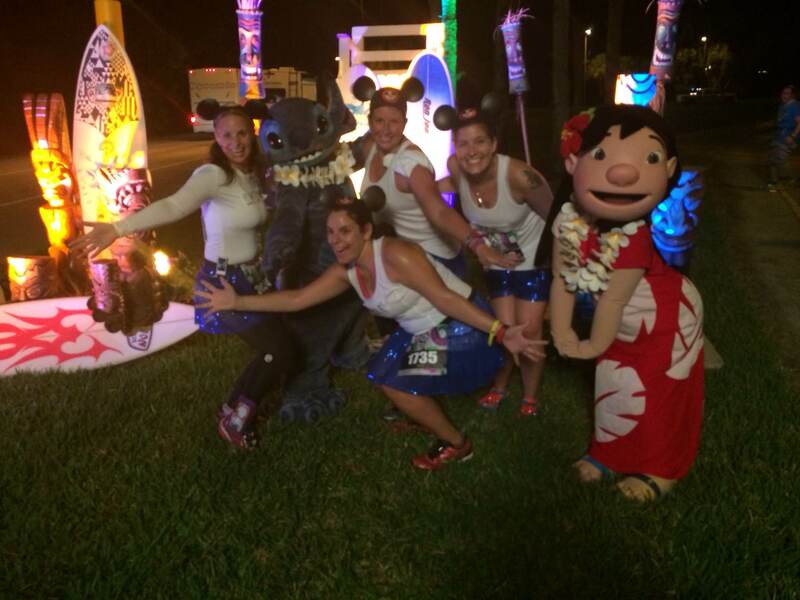 The picture with Lilo and Stitch is awesome and holy crap, that’s a lot of lights!! Like I said, could have been worse. They could have cancelled the race altogether. And I know! The lights! Man they were so cool. I took a bajillion pictures. Well, I think that it is safe to say that this is a race that you won’t be forgetting? Certainly not any time soon! 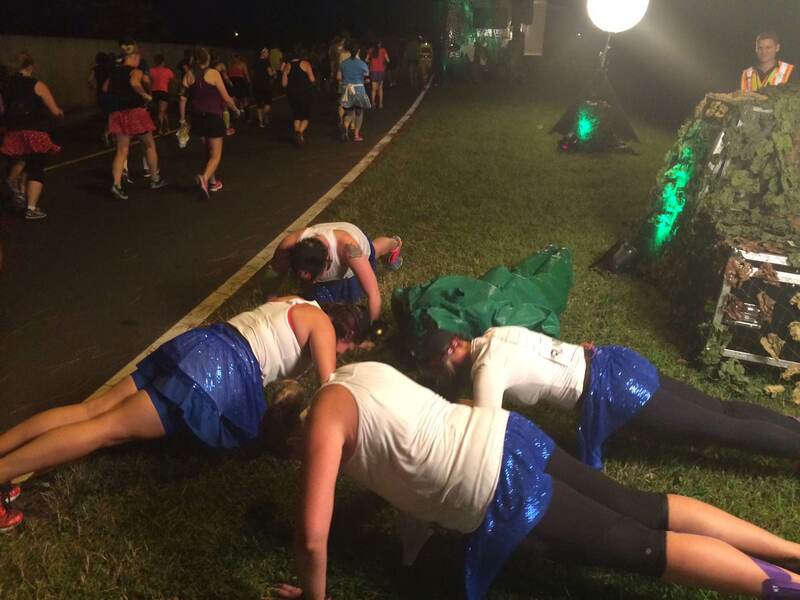 Ok, 1) I LOVE that you guys did the pushups with the green army men!! 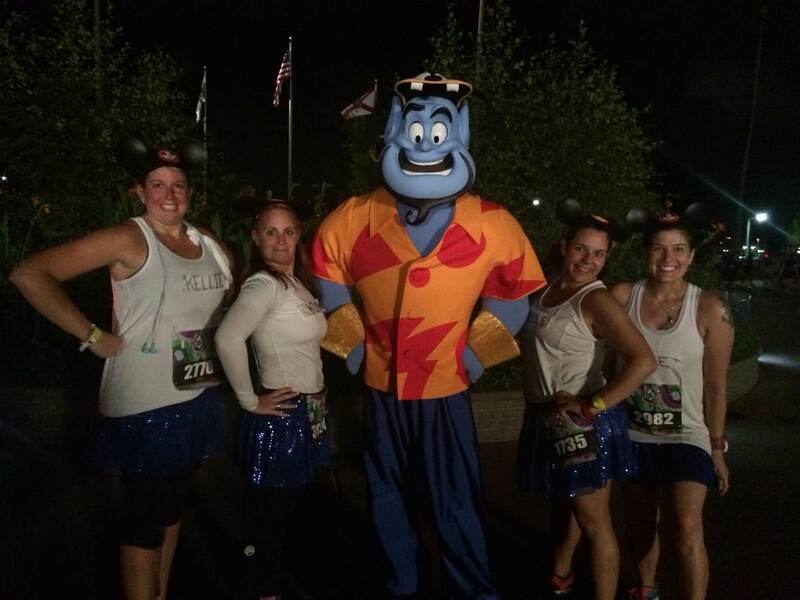 2) I am SO jealous of your Genie picture – he wasn’t there when I went by! and 3) seriously too funny that they commandeered the mens bathroom! So glad we got to finally meet quickly! Hopefully our paths will cross at another race in the future!